What is an IRS Form 4506-T? The IRS Form 4506-T is a Request for Transcript of Tax Return form. What is a 4506 T? The IRS Form 4506-T is a Request for Transcript of Tax Return form. 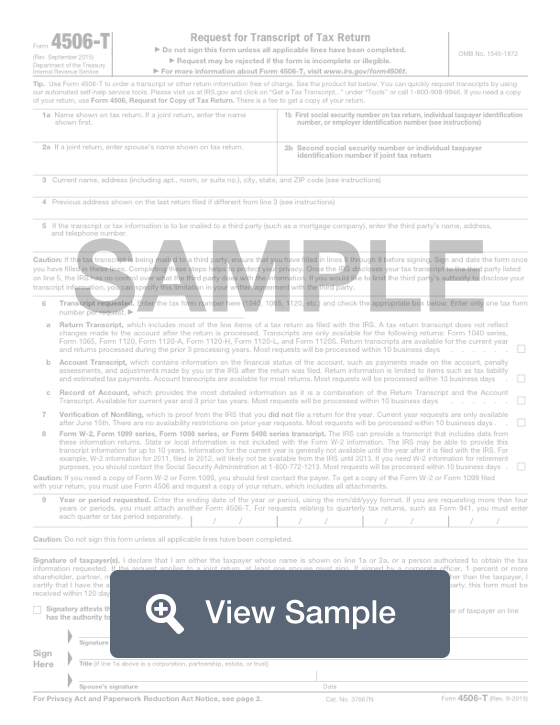 This form is used when people want to receive a tax return transcript, tax return, or other tax records. People can also use this form to request that a third-party receive a copy of your return as well. In order for this form to be processed, it must have certain information. It needs the personal information of the person who is requesting the copy of tax return information in order to verify their identity. It also needs information about what type of tax transcript is requested and what tax year the tax information is from. This tax form can be filled out online and printed out and mailed to the Internal Revenue Service (IRS). Before sending, ensure you have filled out all required fields and signed the document. Otherwise, your request may not be able to be processed. If you only need a copy of the Form 1040 individual tax return, you can fill out Form 4506T-EZ instead. Create a free IRS Form 4506-T in minutes with our professional document builder.